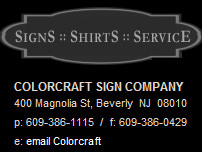 Make Colorcraft Sign Company your one stop shop for all your signs, shirts and other customized products. We Can help make your next sign or project a success! personalized apparel needs. 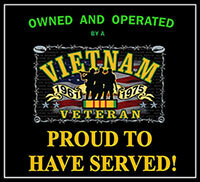 Family owned and operated since 1978, we have been providing a large array of custom signs, shirts, products and services . Our large number of long-time dealers as well as a large level of repeat customers and referrals attest to satisfaction with our goods and services. Our product range of signs, shirts and other custom items is so extensive that we produce a much wider variety than what can actually be shown on this web site. If the item you envision is not displayed let us know what you have in mind for your special project and we will be glad to assist you. for custom items for schools and sports. Join Our Mailing List CONTACT US FOR A FREE QUOTE!